StreetPrint® is a proprietary stamping technology that uses an asphalt-reheating process to produce highly realistic brick, stone and slate imprints on an asphalt base. StreetPrint® offers the flexibility and durability of asphalt combined with beautiful, decorative design effects. This technology offers architects, designers and property owners a wide range of design possibilities. Most importantly, it provides the look of brick and stone without their expense. StreetPrint® uses proprietary asphalt-reheating equipment and special coatings to yield creative finishes on any ordinary asphalt pavement surface. The results are both elegant and environmentally-friendly. Unlike most solvent-based substances used for marking asphalt, the StreetBond™ coatings used in the StreetPrint® process are water-based. That means there are no harsh chemicals or petroleum-based solvents that might harm people or the environment. Still, any asphalt coated by StreetBond™ can be entirely recycled. These coatings are a water-based epoxy-acrylic polymer. The acrylic components help reduce color fading and give the coatings an ability to withstand the sun’s harsh rays here in Arizona. And, the epoxy components help the coatings withstand heavy traffic. Yet, StreetBond™ coatings are flexible enough to allow for the expansion of asphalt without cracking. The coatings adhere extremely well and are resistant to peeling. At the same time, the coatings’ cross-linked polymers resist the effects of water. Asphalt is often preferred for roadways and other surfaces because it’s a continuous unbroken surface, which inhibits problems such as weed growth, erosion and shifting. StreetPrint® offers the advantages of a brick or stone appearance while preserving all the benefits of a continuous asphalt surface. Stamped decorative asphalt is much faster to install than hand-laid bricks, stones or pavers. And, asphalt is more flexible and durable than brick. So, the cost of installing and maintaining StreetPrint® asphalt is much lower while offering the same beautiful, elegant appearance. Best of all, StreetPrint® is highly adaptable – It can be applied directly over new or existing asphalt or concrete pavements. 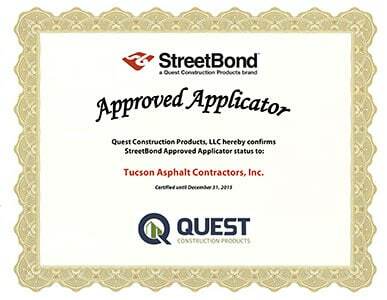 We’re proud to be Tucson’s leading source for the StreetPrint® process and its related StreetBond™ coatings. To learn more about the beauty and cost-savings of StreetPrint®, contact us today. Street Print ™ combines the flexibility and strength of traditional asphalt with leading-edge asphalt coating systems.